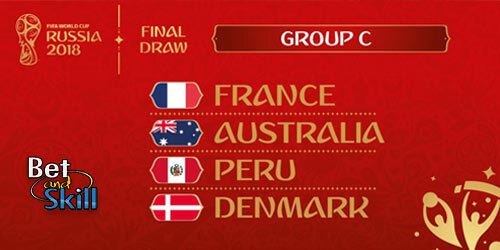 World Cup 2018 Group C consist of France, Australia, Peru and Denmark. This page contains our World Cup 2018 Group C betting preview including predictions on Group Winner, To Qualify, To Finish 2nd, To Finish Bottom and Straigh Forecast. Plus, the best odds, betting promotions and no deposit free bets on Russia 2018! France head to Russia as one of the favourites and a glance at their record easily suggests why. Winners in 1998 on home soil, Les Bleus have made 14 appearances at the World Cup and were runners-up in 2006, while finishing third in 1958 and 1986 and fourth in 1982. Anyway, they secured their ticket to the World Cup finals after an unimpressive qualifying campaign, despite they have the most talented team of the world by miles. Plus, Les Blues were upset by Colombia (2-3) last March before to beat host nation Russia 3-1. Manager Didier Deschamps has been in charge since 2012 and with a win ration of 62.5%, will hope to do better than last time out - a quarter-final appearance in Rio back in 2014. They lost in the Euro 2016 final to Portugal in front of their own fans. Captain and keeper Hugo Lloris has bags of experience with 94 caps, and skippers a side packed full of world-class stars currently in action at some of the biggest clubs in the world. Deschamps also has an embarrassment of riches in midfield, with the likes of Paul Pogba, N'Golo Kanté, Thomas Lemar, Blaise Matuidi and Moussa Sissoko, while his striking options are not bad either. It will be tough to choose a set of forwards from Antoine Griezmann, Alexandre Lacazette, Olivier Giroud, Dimitri Payet and teenage sensation Kylian Mbappé, and the manager will have to work hard on rotation tto get the best out of the superstars on offer. Finally, his rearguard also has plenty of experience, with Bacary Sagna, Raphaël Varane, Laurent Koscielny and Samuel Umtiti all currently at the very top of their game. Australia have become a regular fixture at the World Cup, with appearances in the last three - and this summer will enjoy their fifth outing to the Finals as they became the 31st team to feature after beating Honduras in a two-leg play-off. Despite repeat appearances, the Socceroos have made it out of the group stage on only one occasion, reaching the round of 16 in 2006. Overall, they have won just two games at the World Cup. Angelos “Ange” Postecoglou guided them to Russia with a 3-2 aggregate victory over Syria in the CAF play-off, but then resigned - replaced by 65-year-old Dutch tactician Bert van Marwijk, who has international experience with both the Netherlands and Saudi Arabia. The Socceroos suffered a bloody 4-1 defeat against Norway last March, and managed to held Colombia on a goalless draw few days later. Aston Villa’s Mile Jedinak wears the skipper’s armband and, with 73 caps, is one of the most experienced players in the squad. Most of the Australian players ply their trade overseas and many in England, albeit in lower leagues. Goalkeeper Mathew Ryan is very much a Premier League player with Brighton, while midfielder Aaron Mooy is enjoying an excellent campaign with Huddersfield. Other stars to look out for in midfield include Queens Park Rangers Massimo Luongo, Mark Milligan, who plays for Saudi Arabia side Al-Ahli Saudi FC, and Hull City’s Jackson Irvine. As ever, it’s hard to ignore the talismanic Tim Cahill - well known to English football fans after eight years with Everton and now at Millwall until the end of the season. Despite being 38 years old, he is still a regular in the starting line-up and has 50 goals from 104 appearances. Can he lead the line successfully for the Socceroos once more? Peru became the final team to secure a World Cup spot. They snatched the South America play-off spot from Chile on goal difference. Then, they qualified thanks to a 2-0 win over New Zealand in the second leg of their playoff match, ensuring qualification for La Blanquirroja for the first time since 1982. Well-travelled Argentinian coach Ricardo Gareca will be in the dug-out for the South Americans’ first World Cup adventure since 1982. It will be La Blanquirroja’s fourth outing in the competition and their best return is a trip to the quarter-finals in 1970. Peru could be the surprise package of this group, considering recent form: they recorded back to back wins last March against Croatia (2-0) and Iceland (3-1). Squad members feature all over the world, with Watford winger André Carrillo having won 41 caps to date while Orlando City’s Yoshimar Yotún has 70 to his name. Flamengo’s Paolo Guerrero is the star man up front, with 32 goals from 86 outings, while Jefferson Farfán has 23. Alberto Rodríguez captains the side and is among an experienced group of defenders including Christian Ramos and Luis Advíncula. Denmark back to the World Cup finals courtesy of their play-off victory over the Republic of Ireland nd will appear at their fifth World Cup later this year. Quarter-finalists in 1998, they have made it out of the group stage on only one other occasion, with a last-16 berth in 2002. In recent firendlies, last March, they managed to beat Panama 1-0 but drew 0-0 against Chile. Veteran tactician Åge Hareide has been in charge since 2016 and has a win ratio of 52.63%, while Sevilla centre back Simon Kjaer skippers the side. In goal, Leicester goalkeeper Kasper Schmeichel anchors the team and has Chelsea’s Andreas Christensen in front of him, along with the likes of Brentford’s Andreas Bjelland and Huddersfield’s Mathias Jørgensen. De Rød-Hvide (the Red-White)’s strength is in midfield, where Tottenham superstar Christian Eriksen pulls the strings and will hope to add to his 21 international goals, while Copenhagen’s William Kvist had earned 77 caps to date. Nicklas Bendtner, meanwhile, may be much-maligned at club level but the 30-year-old has 30 international goals from 79 outings while Feyenoord’s Nicolai Jørgensen has eight. They conceded just eight goals in qualification Group E. As expected, much will depend on the form and fitness of Eriksen. Our expert team have selected the best odds available on the World Cup Group C Winner market. Back your favourite team at the odds shown below or claim a price boost by visiting our Enhanced Betting Odds section. France should comfortably top the Group C standings. It will be a hard-fought battle for the second spot as Denmark is favourite but Peru and Australia couldn't be ruled out. We post sports betting predictions each and every day and you’ll find them here on our homepage or over on our predictions page. You won’t find better football predictions anywhere else. Take a look at our FIFA World Cup betting tips. We won't let you down! Predict the winner of every match* at this year's World Cup. Get them all correct and the £100 Million is yours!!! Offer ends 13/06/2018. Online entry required. Registered customer (new or existing) in UK (excl. Gibraltar & IOM), Denmark, Finland, Norway & Sweden only. Prediction requires 64 correct match outcomes (not the scores). Winner(s) will receive or share £100M prize. 1 free entry per person. 18+ BeGambleAware.org. Please play responsibly. T&C apply. "2018 World Cup Group C predictions, betting tips, odds and free bets"